If you've been a reader of The Book Chook for a while, you'll no doubt have noticed that I love opportunities some websites and software give our kids to create and express themselves. For me, Comic Editors are right up there with Image Editors and other digital storytelling sites. If you're a classroom teacher, librarian, parent, or anyone involved with kids, I urge you to explore comic or cartoon creation with your children. 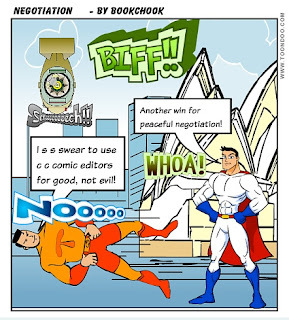 For more information, check out my website, where you can download a free PDF, Using Comic Editors with Kids. 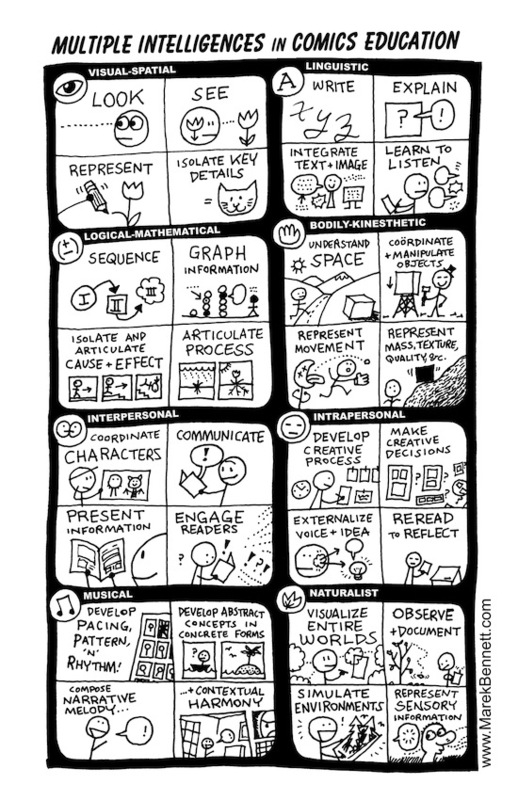 When kids create comics, apart from the obvious skills of writing, sequencing, etc, they're using many different kinds of intelligences. Many thanks to Marek Bennett of Comics Workshop Blog, for use of the image below which sums this up so well. * Create a class comic book from individual class comic pages where kids use software or an online image editor to tell about themselves. * Write a book review or give feedback about an excursion using a comic template. 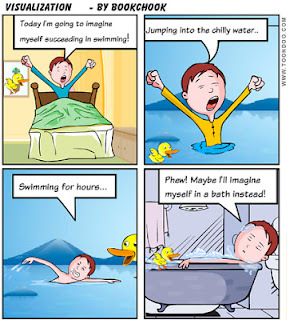 Kids can draw favourite scenes as illustrations, or find CC licensed images that help illustrate what they want to say. * Create a story about a cartoon character a child has drawn, or choose characters from clipart of comic editors. Tell the story in a four or five frame comic template. For the story at bottom, Visualization, I simply found several poses of a character at ToonDoo, then wove a simple tale about them, chose backgrounds to suit and created dialogue to tell my story. Another idea is to create a story about a child's toy, set up individual scenes with the toy, then use your camera to grab the scenes. You can read more about this process in Visual Story Telling. * Create a record of just about anything! If you've just had a 5 year-old birthday party and you took lots of pics, consider creating a cartoon using some of the images. It's a wonderful activity to share, helping kids to learn all sorts of things with you. And it makes a great souvenir of the party to send to attendees. Or use some of those pictures kids snapped on a recent class excursion to make a class comic to remember the event. * If your kids are learning about information texts, have them develop an instruction manual and use a comic editor to publish it eg Comic Life. They can share how to play a sport, tie a shoelace, look after lizards, bake cupcakes etc. If you're looking for models to inspire the kids, check out Howtoons. Great visuals! * Research a topic and present key facts in the form of a comic or poster or little magazine. Add speech bubbles and text via an online image editor or photo software. Toon Doo Book Maker lets kids compile individual comics into a book. 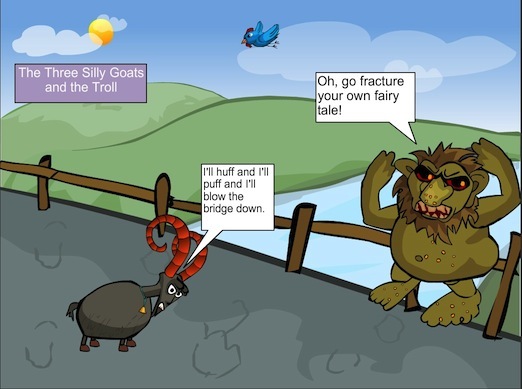 * Fracture a fairy tale and make a digital story of it. Creaza is particularly good for this as it has "worlds" of fairytale settings eg Billy Goats Gruff (see above) and Red Riding Hood. 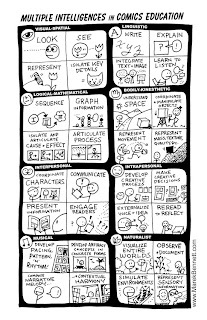 * Use a comic template of four or six frames to describe the life cycle of something. * Practise writing in your own or another's language. Use the comic format to focus on dialogue and vocabulary. Inventing characters and a story gives context and enjoyment to memorising vocabulary, as well as a purpose for communication. Or use a comic template to simply label everyday items you've found in photos. * Present the life of a famous person in comic format. * Make up a short story that's really an ad for a product and present it as a comic. 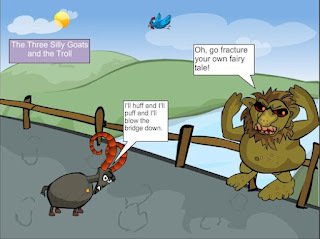 * Re-tell a nursery rhyme or fairy tale using software like Comic Life. Or try some online comic editors like Creaza or Kerpoof. * Create a simple sequential story and set it out with specially taken photos in a comic template. Add captions as needed. Cut the comic up and have kids re-sequence it. *Add empty speech bubbles to a real comic or images for kids to fill in. If you have a print comic, white out the speech bubble and have kids invent their own dialogue. Find images online that lend themselves to text, and help kids think about what a character might be saying/thinking. You can also do this with family snaps. Use an online image editor or your camera software to add speech bubbles that show what Dad might be thinking! *Make an alphabet book for toddlers using pictures of family and everyday objects and activities. Try one page and image to each letter. Add interest by putting in captions and/or speech bubbles. 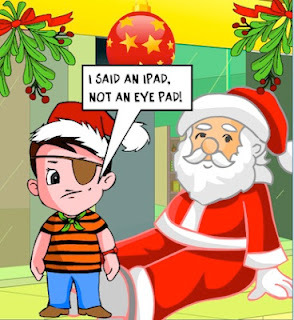 *Help kids use a comic editor with some Christmas elements in it to make a card for someone special in their lives. Creaza has a nativity world in Cartoonist, ToonDoo have five pages of cartoon elements come up when you put "christmas" into their search box, and Disney Prep and Landing Photo Mashup has lots of sparkly stuff. If children are stuck for ideas, suggest they re-tell a favourite joke in comic format, the way I did below via ToonDoo. My kids love making comics. We've been using the Strip Designer or Comic Strip apps to make some comics. @Miss Chaffey I've been playing with those apps, so I'm very interested in your posts and will link once I have done the reviews. Loved seeing such creative enthusiasm! What a great writing motivator! Thanks for sharing. I am a new follower.